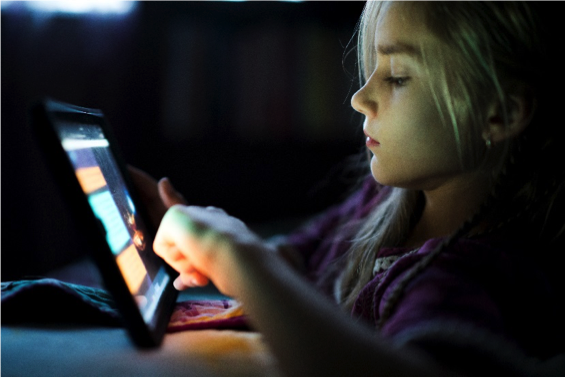 Many of the threats to your child’s vision stem from blue light. Sources of harsh blue light include: modern indoor energy efficient lighting, smart phones, computers, tablets, any digital device, even your television. Designers of these gadgets intentionally increase the amount of blue light emitted to brighten their screens. The problem is this high energy blue light destroys the nutritional network that supports the retina and over time leads to macular degeneration, an irreversible loss of central vision. This same blue light disrupts circadian rhythms, disrupting sleep which can lead to behavioral problems and general health concerns. The complicating issue is that young people can spend more than 7.5 hours every day on a computer (think classroom time) and phone, tablets and television. Kid’s shorter arms means these devices are held much closer to the eyes increasing the amount of blue light reaching the back of the eye by a factor of four. The internal lens in a young eye is clearer, allowing more blue light to flood the retina. Finally, the detrimental effects of blue light exposure are cumulative, meaning the more years of exposure, the more damage will be done. It is imperative that all eyes be protected from blue light overload. But children are particularly at risk. Parrelli Optical has partnered with leading manufacturers to offer a variety of protective measures. Let our experts design eyewear for your child, and for you, that will protect delicate eye tissue from the damaging rays of blue light and provide a lifetime of good vision. Located in Beverly, Cambridge, Danvers, and North Andover so call Parrelli Optical® for your preferred appointment today.